OK, now normally we would have an automated process in place that populate this table for every table within every database on your instance. We could even enhance this to store every table within every database within every instance on a central collection server. Since this demo requires some immediate data however, you can use the query below to insert data from 3 different tables over the course of 1 year. This returns a data set that looks like this with 36 rows. Now we’ll amend the query by making the original query a CTE and then applying the PIVOT operator. As you can see below, this query now only returns 3 rows but has all the same data. 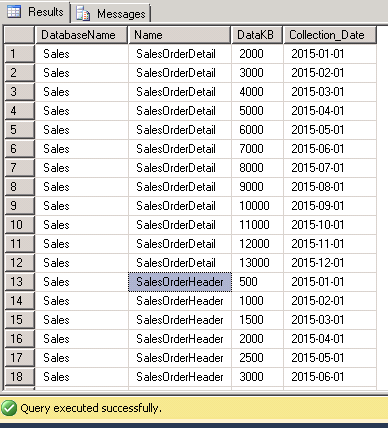 The values from column Collection_Date are now column headers and the data that was previously displayed in the row for each of these Collection_Date values in now displayed in the column. The IN clause will only accept a static list of values. (Known as spreading values). 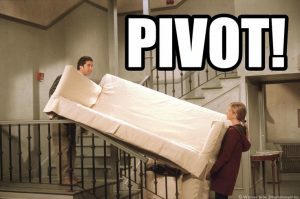 You cannot use a subquery as an input so you need to know the values you want to pivot on. This can be worked around using Dynamic SQL however this takes a bit more effort. It should be easy to see at a glance how your data is trending. In this scenario, I want to see the data size for each table in each month. This shows me my rate of growth. Note: In reality, this table could also be enhanced by storing other useful data such as row count, ReservedKB and UnusedKB however the point of the example was to show a simple PIVOT query in T-SQL.